Uma Otima Ideia para Um Natal Cheio de Actividades e Apenas €15,00! From cuddly teddy bears to smiling snowmen, this collection is bursting with creative ideas and winter fun. 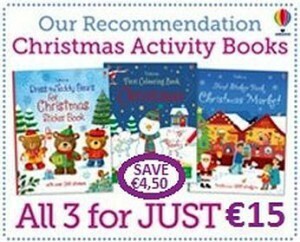 Featuring: Dress the Teddy Bears for Christmas, First Colouring Book Christmas, and First Sticker Book Christmas Market.